Before you delve into actual cheese making, I would like to present you with some thoughts in preparation. More extensive information regarding the cheese making process is presented in Artisan Cheese Making at Home, but as an overview of that content here are some tips which I feel will be useful to you. Knowing in advance what to look for and what to expect in the cheese making process will help you to navigate through any obstacles with greater success. On this road to mastering making world-class cheeses, itís essential that you approach the process with eyes wide open, learning from whatever is presented. Be open, flexible and persistent. Donít give up. Be dedicated, attentive, observant, and inquisitive. As your cheese making skills develop, any challenges that come your way will be easier to address. As the old adage goes, there is no substitute for experience. Above all, have fun in the process. Expect that you wonít have all the answers yourself. Let this book be your guide. Expect that your first few tries at making any cheese may not be successful. Expect that your first few tries at making Mozzarella will probably not be successful. Expect to be frustrated and have disappointments. Expect to come face to face with Fuzz & Slim. Mold and bacteria will grow on your cheeses. Expect to be thrilled with (most of) the cheeses youíve made. Expect others to be in awe of what youíve done. Expect to be invited to more parties and bring cheese. Expect kids (children) to want to make cheese with you. Expect to acquire a greater appreciation for hand-crafted cheeses. Expect to acquire a greater appreciation for what artisan cheese makers do for a living. 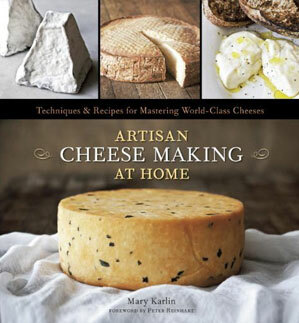 Expect that you will never stop learning about cheese making. Expect to become more interested in making other foods with your own hands. Expect the learning and sharing processes to be fulfilling and life-long. Look for curds to magically appear from the white liquid. Look for the curds to tell you when theyíre ready. Look for a clean break in the curds as a sign of readiness for cutting. Look for curds to firm up and shrink in size during stirring, as they expel more whey. Look for fresh, sweet tasting or slightly acidic, but not bitter or sour tasting curds. Look for shiny, stretchy curds in pasta filata cheeses. Look for firmly packed curds and smooth surfaces before pressing cheese. Look for (and remove) moisture build-up in ripening boxes and on cheese. Look for bloomy mold surfaces or desirable surface bacteria to appear after about 10 days. Look for (and remove) unwanted mold or bacteria growth on the cheese. Look for firm rind development. Look for answers to your questions. Look for adding more spaces to ripen cheeses. Look for more available days to make cheese. Now go forth and make cheese!